New Zealand won Commonwealth rugby sevens gold after recovering from 10 points down to beat Australia 24-17. 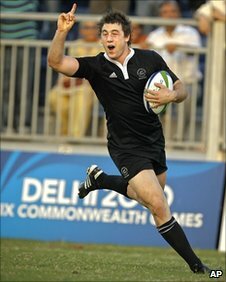 The Kiwis scored the last three tries of the Delhi final to secure their fourth successive Commonwealth title. England missed out on a medal after losing 33-12 to New Zealand in the semi-finals and 17-14 to South Africa in the match for bronze. Wales' campaign ended in a 31-10 loss to New Zealand with Scotland thumped 34-0 in the plate final by Samoa. New Zealand were without playmaker Tomasi Cama for the final but it their attacking instinct appeared undimmed as Lote Raikabula opened the scoring. But a yellow card to All Black Liam Messam opened up space for Wallabies wing Lachie Turner to cut the deficit to 7-5 before a finely judged chip-and-chase from Luke Morahan left New Zealand three points adrift at the break. The possibility of the sevens title being won by a team other than New Zealand for the first time increased as James Stannard dotted down to open up a 17-7 lead for Australia on the resumption. The response was emphatic however, as substitute Sherwin Stowers' pace took him over and DJ Forbes' support running added another try to put New Zealand 19-17 ahead before Kurt Baker touched down with the last play of the game. England had earlier edged out World Sevens Series champions Samoa 7-5 in the quarter-finals, but were swept away by New Zealand in the semis. Trailing 19-0 at the start of the second half, Isoa Damudamu's score briefly raised hopes of a comeback before Cama and Raikabula weighed in with another two scores for the New Zealanders. Ben Ryan's men led 14-5 at the break in their bronze medal match against South Africa after Bristol winger Matt Turner had driven through some flimsy defence and Dan Caprice had stepped his way over. But two second-half tries hauled South Africa into the lead before Ben Gollings launched a last-ditch rescue act, but his inside pass to John Brake was knocked on and England's hopes of a podium place evaporated. "We leave Delhi without anything and we are bitterly disappointed," said Ryan. "It is very frustrating, but I believe in these players and believe we can go on and win a World Series with this side."